Ever since we started reviewing cannabis vaporizers and pens here on Digital Trends, we’ve seen devices from a host of manufacturers come through our doors. Some are stalwarts of the industry like Pax, Grenco, and Kandypens, while others are brand new such as Prohibited and Cloudious9. But one company hasn’t been able to break through even despite being in the industry for the better part of a decade, and that’s Dr. Dabber. While the Las Vegas-based company has quite the extensive line of concentrate-centric vapes to choose from, the ones we’ve received in the past haven’t exactly impressed, and were often easily eclipsed by other companies in terms of both performance and build quality. For this reason, we were admittedly a bit skeptical when we received a pre-production model of Dr. Dabber’s Switch. At $400, it’s nearly at the top of the price range for portable vaporizers, and its large size is a little intimidating. To find out if it’s actually worth your time, we used it as our main rig for a few weeks and put it to the test. The first thing you’ll notice about the Dr. Dabber Switch is its size. Make no mistake: this thing’s big. Fully assembled with the bubbler top attached, it’s over a foot high and four inches wide. However, despite the Switch’s size, it’s also fairly light. We’d compare it to the weight of a larger high-quality glass water pipe. Operation of the Switch is easy. A switch (go figure, right?) on the bottom ring of the device allows you to quickly go between leaf and oil modes, with three button operation, while the + and – keys allow you to switch between five different power levels per mode, and a large center button makes it easy to start the heat-up process with a single push. The heating element on the top of the Switch features induction coils surrounded by ground glass, and removable metal cups work to heat your material via the same technology as induction cooktops. The bubbler itself is made of heavy-duty borosilicate glass and is as solid as you’d expect. You’ll be able to clean this easily just like you would any other dab rig (we highly recommend Mile High Cleaner), and the chamber is large enough to allow for some heavy-duty rips. Included with the Switch is a glass loading tool and carb accessory which works great, as well as a pair of reverse-action tweezers that help you remove and place the induction cups after loading. What makes the Dr. Dabber Switch so special is its ease of use. We had absolutely no problem loading the device at all. You simply fill the induction cups: a black cup for loose leaf that holds about a 1/3 of a gram of product, and a white cup for concentrates (be sure to use the correct one!). Just use the tweezers to place it back in the device, switch it on, select a power level, and press the center button to start the process. When the LED lights on the top of the device to turn from red to green, you’re clear to start puffing. Induction heating is truly a dream. Thanks to this technology, we were impressed by how fast the Switch was able to power up produce great vapor: less than ten seconds every time. When the smoke sesh was over, the device’s self-cleaning function allowed us to burn off excess product after using it for concentrates easily, making regular alcohol baths for the pieces unnecessary. There’s no other way to say this: The Dr. Dabber Switch rips. At the three highest power settings on either mode we were regularly getting huge clouds out of this thing. In leaf mode, the induction heating vaporized but also burned the material evenly, and in concentrate mode all that was left was residue (which is what you want). 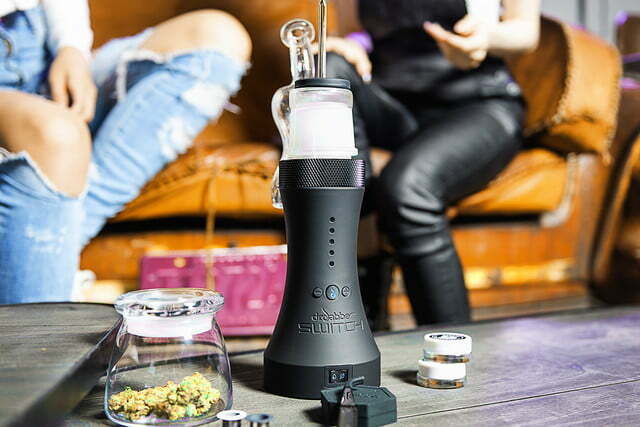 Of any vaporizer we’ve tested, the Switch is actually the first to do both forms (flower and concentrates) equally well, and perhaps the closest experience you’ll get to the traditional dab rig/torch method, but without the potential for third-degree burns. Why is it so big though? Much of the size of the Switch has to do with the removeable 33.3 watt-hour battery, which is one of this rig’s biggest strengths. 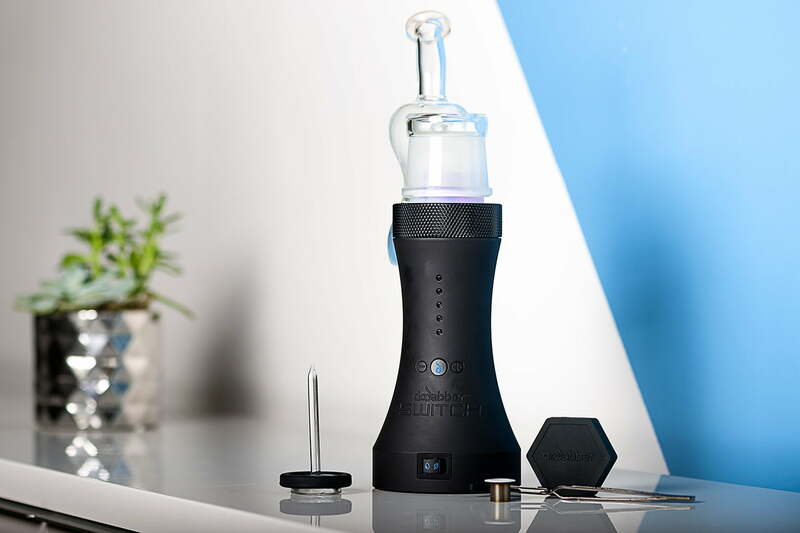 While Dr. Dabber claims that you’ll get up to 150 cycles on a full charge, we only got about 40 percent of that on average – most likely because we used the self-cleaning function often. The Switch is also is a “passthrough” device, so if you want to use it while it’s connected to the included AC charger, you can do that too. No waiting around for it to charge before you smoke. Overall we had almost no trouble with this rig — although a few times it appeared to get caught in a “cool-down cycle” that couldn’t be switched off (though it’s worth mentioning that we had a pre-production device, so this issue may have been fixed by now). This is typically because the cool down cycle was interrupted, and a power cycle fixed it. There are some advanced functions which allow for even greater customization, including heat settings and “hold time” – where the unit holds the desired heating profile for anywhere from five to 30 seconds. Most of us won’t need to mess with this, but the options are there in case you need them. The LEDs around the top of the device can also be set to either light up as one of 10 different solid colors, 14 different cycling colors, or in stealth (no LED) mode. It’s a cool feature, and more of a conversation starter than anything, but hey if you want to customize your device, here’s one way to do it. Dr. Dabber’s warranty for the Switch is pretty fair, although far less than the five and ten-year warranties of many of its smaller brethren. A two-year limited warranty is provided on the electronic components and battery pack, but the glass pieces do not carry a warranty. Break the bubbler and you’ll need to fork over $75 for a new one. We’d assume, however, that if there were imperfections in the glass that a quick email to their customer support would help remedy the situation. 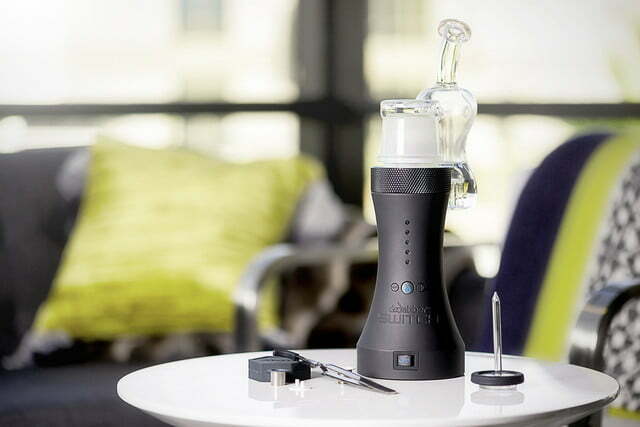 Despite our misgivings about earlier Dr. Dabber products, the Switch is by far the best vaporizer we’ve tried to date. Induction heating certainly seems like the way of the future when it comes to weed vapes, given its efficiency and proper vaporization of product. Dr. Dabber’s method here is patent pending, so it may be awhile before we see something similar. For the serious smoker, no. For cannabis users who are new to the game, there are better options out there. While the Switch is easy enough for just about anyone of any experience level to use, the $400 price tag is going to scare most away. For these folks, we’d recommend going with more entry level unit with a much more budget-friendly price tag. However, for experienced cannabis users, there is no current equal to this device — at least that we have tested so far. In terms of efficiency and performance, this rig is top-tier and you won’t be able to do much better. At least in the near term, we don’t expect to find any devices that may replace this one in terms of the full package. One area where we’re a bit disappointed in is the fact that there’s no app control. It sure would be nice to have the ability to set custom heating profiles without fiddling with the device — which is something you can do with other portables like the Pax 3 and Davinci IQ. This said, the construction of the device is sturdy and not cheap, so there’s no reason why your Switch shouldn’t give you years of reliable performance. If you are an intermediate or advanced cannabis user, this is definitely a device to consider if you have the disposable income to do so. However, if concentrates aren’t your thing, or you simply don’t need a device that can handle both flower and concentrates, then you’d be wise to consider other (likely cheaper) options.